Styling updates highlight 2020 Mercedes-Benz GLC revamp. Should you wait? What changes will make the 2020 Mercedes-Benz GLC different? Freshened styling, revised features, and potentially more power. These changes mark the midcycle update for Mercedes-Benz’s best-selling vehicle and America’s top-selling premium-compact crossover. The GLC launched for model-year 2016 and replaced the German automaker’s original entry the class, the 2010-2015 GLK. It slots into Mercedes’ crossover lineup between the subcompact GLA and the midsize GLE. The stylish five-seater comes in two body styles, a squared-up wagon Mercedes calls the GLC SUV, and a sportier, more expensive fastback variant it calls the GLC Coupe. Both will again be available in broad lineups that span relatively sedate four-cylinder models to rip-roaring 469-horsepower performance editions. The SUV can also be had as a plug-in hybrid, while the Coupe can go full out as the 503-horse GLC63 S from Mercedes’ heralded AMG performance wing. The depth and breadth of the GLC portfolio has resonated with buyers. Sales are up an astonishing 51 percent through October 2018, putting it ahead of the rival Audi Q5, Cadillac XT5, Acura RDX, and BMW X3, in that order. All those nameplates, incidentally, are also their respective makers’ top-selling vehicles – a testament to the popularity of premium compact crossovers. Waiting means you’ll get a refreshed GLC with the most up-to-date styling and technology, two very important attributes to buyers in this market segment. Of course, the ’20 will almost certainly cost more than the ’19. Its appearance will change only subtly. Its dimensions and basic equipment won’t be altered. And just one model – the performance GLC 43 – is likely to get more power. If you prefer not to postpone, the 2019 GLC is highly compelling. The variety of powertrains, appearance packages, and interior upgrades is tempting. It’s extremely well built and very good looking. All models are comfortable, although you’ll sacrifice some cargo volume and the roominess of SUV’s commodious rear seat if you opt for the racier Coupe. Every version drives with uncompromised composure, and the high-performance models are genuinely thrilling. None of that will change with the 2020 updates, although dealers are likely to be a little more willing to work with you on 2019-model purchase or lease deals to clear inventories ahead of the refreshed GLCs. Expect the 2020 GLC lineup to mirror that of the 2019. Both SUV and Coupe will again be available in basic GLC 300 trim and as the high-performance GLC 43 and the higher-performance GLC 63. Again unique to the SUV will be the GLC 350e plug-in hybrid and exclusive to the Coupe will be the hot-rod GLC 63 S. Mercedes had in the past offered the SUV with a diesel powertrain but did not renew it for model-year 2019 and won’t for 2020. Yes, although changes will be most pronounced within the cabin. Outside, anticipate a facelifted front end with revised headlights and a new grille for a look more consistent with the design language Mercedes is introducing with its new A-Class sedan. Re-shaped taillights should also be part of the deal. Full LED illumination would be standard. The 2020 GLC 43 will continue with unique styling cues, most prominently a more aggressive grille and larger wheels on low-profile performance tires. The GLC 63 and 63 S would have yet another grille variation recalling past Mercedes racing cars, plus larger lower air intakes to help cool their brutishly powerful engine. Updates to the interior will likely be more extensive. Again, the 2020 GLC could follow the A-Class with a redesigned instrument panel featuring and updated digital instrument cluster and infotainment display. Likely standard on the GLC 300 would be 7-inch versions of each. Optional on those grades and standard otherwise would be larger 10.25-inch widescreen units. The latter setup would place the panels immediately adjacent to each other to appear as a seamless display from the instrument cluster across the central dash. Support for Apple CarPlay and Google Android Auto would be standard across the board. Unchanged should be the GLC’s first-class interior accommodations. Returning should be a variety of upholstery colors and interior accents consisting of genuine wood and/or aluminum. AMG models would up the sporty flair with aggressively bolstered front seats and a racing inspired flat-bottom steering wheel. Likely optional on most grades would be ambient interior lighting that offers 64 different hues. Passenger room should remain outstanding thanks to a wheelbase (distance between the front and rear axles) that’s among the longest in the competitive set. Front and rear occupants should enjoy generous legroom regardless of body style. Headroom will remain very good in the SUV, but tall rear-seat occupants in the Coupe might find themselves shortchanged by the sloped roof line. That roofline also penalizes cargo volume. The GLC Coupe is about 3 inches longer overall than the SUV but has 17.4 cubic feet of storage space behind the rear seat backs and 49.4 with them folded. The SUV has 19.4 and 56.5, respectively. Still, both numbers are slightly below par of the class and roughly what you get in a compact hatchback car. A few, perhaps. Unchanged will be the GLC’s basic underskin design, which is shared with the Mercedes-Benz C-Class sedan. Both SUV and Coupe versions of the GLC 300 should reprise a 2.0-liter turbocharged four-cylinder engine producing 241 horsepower and 273 pound-feet of torque. It’ll again pair with a 9-speed automatic transmission. This powertrain is good for 0-60 mph in around 6.4 seconds. That’s roughly on par with small luxury crossovers from other companies, but among its peers, the Mercedes’ 2.0 turbo and 9-speed auto is arguably is unmatched for smoothness and response. The GLC 300 SUV comes with rear-wheel drive. The Mercedes-Benz 4Matic AWD system standard on the GLC 300 Coupe and optional on the SUV delivers 56 percent of available torque to the rear wheels, which aids dry- and wet-road traction while maintain a rear-drive handling balance. Every GLC 300 will continue with Mercedes’ Dynamic Select system that allows the driver to alter powertrain, suspension, and steering settings to suit their tastes. An adaptive air suspension should remain optional for about $1,900. The plug-in-hybrid GLC 350e SUV would return in AWD-only form and pair the GLC 300’s turbo four-cylinder with an electric motor for a combined 315 horsepower and 413 pound-feet of torque. The battery would get its initial charge from the grid and provide enough juice to let the vehicle travel for up to 20 miles on electricity alone. After that charge depletes, the 350e would behave like a conventional gas/electric hybrid. Despite the instant torque available from the electric motor, Mercedes says the plug-in will do 0-60 mph in 6.2 seconds. That’s a little slower than expected for this technology. Curb weight is the primary culprit. The GLC 350e is more than 500 pounds heavier than the GLC 300. It also uses a less sophisticated 7-speed automatic transmission. Performance fans should again seek one of the AMG GLC models. The Mercedes-AMG GLC 43 is the mildest of the lot, if you consider a 3.0-liter twin-turbocharged V-6 engine with 362 horsepower and 384 pound-feet of torque tame. Some reports suggest Mercedes could boost output of this engine to around 385 horsepower, which could lower its 0-60 acceleration time to about 4.5 seconds from the 2019 models’ 4.8. The ’20 GLC 43 would again include air-spring sport suspension and additional Dynamic Select modes geared toward high-performance driving. The current GLC 300 isn’t necessarily quick, but it strikes a nice balance between comfort and handling prowess, especially on the standard 18-inch wheels. Mercedes offers 19- and 20-inch options, but ride quality diminishes the larger you go. It’s less of an issue in the GLC 43, which we consider the benchmark balance of performance and value among sporty premium-compact crossovers. We prefer it overall to rivals such as the Audi SQ5, BMW X3 M40i, Jaguar F-Pace S, Rover Range Rover Velar SC, and Volvo XC60 T8 plug-in hybrid. Unlikely, barring aerodynamic improvements resulting from the updated styling. As a reference, the 2019 EPA ratings for the GLC 300 models – the only GLC ratings available in time for this report – were 22/27/24 mpg city/highway/combined for the GLC SUV with both rear-drive and AWD, and 21/27/23 for the AWD-only GLC 300 Coupe. For other GLC models, 2018 GLC 350e rated 56 MPGe (miles per gallon equivalent) running on battery power only. The EPA doesn’t list a rating while operating as a conventional hybrid but rates the ’18 GLC 350e at 25 mpg city-highway combined using only the gas engine. 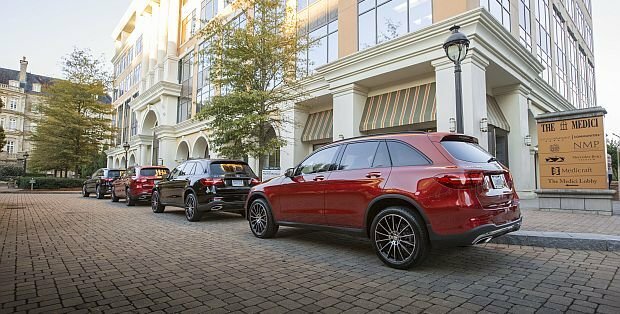 All 2018 AMG GLC 43 models rated 18/24/20 mpg. The AMG GLC 63 SUV rated 16/22/18 mpg. The GLC 63 and 63 S Coupe each rated 15/22/18. Premium-grade 91-octane gasoline should remain a requirement for all 2020 models. It’s possible Mercedes-Benz will add some currently optional driver-assistance features to the standard equipment list of all models. Autonomous emergency braking that can stop the vehicle without driver intervention to avoid a rear-end collision is standard across the board. However, items such as blind-spot warning with rear cross-traffic alert, lane-departure warning with automatic steering correction, and radar cruise control that maintains a set following distance from traffic ahead are optional on the ’19 GLC 300 as part of a $2,250 Driver Assistance Package that also requires spending an additional $2,200 on the Multimedia Package and $1,250 on the Premium Package. Granted, each of these other packages includes worthwhile convenience features, but many rivals include these valuable aids without needing to spend anything extra. Barring this change, the feature set for the 2020 GLC should stand pat. All models would include heated power front seats with driver-seat memory positioning, power rear liftgate/hatchback, and power-folding exterior mirrors. The GLC 43 would add its high-performance engine, extra drive modes, sport suspension, blind-spot alert with rear cross-traffic detection, and AMG-specific exterior and interior design cues. GLC 63 and 63 S would get their own drivetrain, styling, and trim pieces. They’ll almost certainly increase, especially if Mercedes-Benz adds more standard equipment to the mix. GLC resides in the upper tier of premium-compact crossover SUVs, with pricing that tracks in line with its fellow European rivals from Audi, BMW, Jaguar, Land Rover, and Porsche. Our base-price estimates include the manufacturer destination fee, which was $995 on the 2019 GLC. Expect the GLC 300 SUV to start at about $42,000 with rear-wheel drive and $44,000 with AWD. The GLC 350e will likely check in at about $52,000. The AMG GLC 43 and 63 will probably carry starting figures of about $58,000 and $72,000, respectively. Among Coupes, the GLC 300 will probably start at about $49,500, the AMG GLC 43 at $62,500, the GLC 63 at $75,000, and the GLC 63 S at $82,500. Returning to the options list will be extra-cost paint colors ($720-$3,950), wheels ($500-$2,750), and the Advanced Lighting Package ($1,050-$1,650), which includes adaptive LED headlights, automatic high-beam assist, and on AMG models, ambient interior lighting. Leather upholstery and a power passenger seat with memory positioning should remain available for $2,050 on select models. Expect the overwhelming majority of GLC 300 vehicles to include the $1,250 Premium Package (blind-spot alert, keyless access, 6-month satellite radio subscription) and $2,200 Multimedia Package (imbedded GPS mapping with touchpad controller, in-dash CD/DVD player, and 5-year satellite radio subscription). A Parking Assistance Package ($1,290) for most GLCs would include a surround-view camera system, hands-free parallel parking, and a hands-free power liftgate. AMG buyers can add a performance exhaust system for $1,250 and long-life carbon-ceramic brake rotors for $5,450. Expect a 2020 Mercedes-Benz GLC release date in the fall of 2019.